Andrea Bargnani, the 1st round pick of the 2006 NBA draft was recently traded by the Toronto raptors to the New York Knicks. This trade has been the topic of many questions and much debate so I believe its time to break it down. The Toronto Raptors received Steve Novak, Quentin Richardson and Marcus Camby as well as a 2016 first round pick and two second round picks, with the Knicks receiving the 27 year old, 7ft, 256lbs Center from Italy. With only field goal percentage improving on the stats sheet it is impossible to say statistically speaking that the Knicks have improved, although what is not shown is the match up nightmare matchup that the 7ft Italian can be, specially playing alongside a player requiring double teams such as Carmelo Anthony. The Knicks have received criticism for picking up a big man who has been somewhat injury prone in recent years. Bargnani only played in 35 regular season games throughout the 2012/13 season, and 31 the season before. In making judgement and assessing this we must take into account the fact that on average the three newly acquired Raptors only averaged 51 games between them as well as the fact that in the last two post season showings it has been clear that Steve Novak struggles to make an impact in the playoffs. It is clear the the Knicks have taken a risk, however not much attention has been paid to the potential reward. In Andrea Bargnani’s last ‘healthy season (10/11) as a Raptor he averaged 21.4ppg and 5.2 rpg, while shooting .448% from the field and .345% from the beyond the arc making a clear statement to anyone that when he is healthy he can produce at a high level. 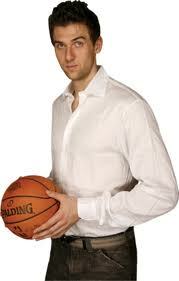 I think a question many are asking is, does Andrea Bargnani fulfill the Knicks needs? and after a somewhat disappointing playoff run (second round defeat at the hands of the Pacers) that is a legitimate question. The Knicks weakness seemed to be an ability to rebound the ball, something which many would presume Bargnani’s 7ft frame would help with, however statistics have proven that it will simply not be the case (averaging 4.8 over his seven-year career). If we look at this in a different light perhaps, concentrating on Bargnani’s ability and versatility to play the pf and center position, then he may help after all. Carmelo Anthony spent a majority of his time on the court throughout the 2012/13 season as an undersized power forward, something which was relatively successful for the Knicks, with Carmelo able to abuse the bigger slower defenders and score the ball at will. However against bigger bodies (eg Grizzlies, Pacers etc) it was clear that physically he did not match up well on the defensive end, and coming in at 26th in the league for total rebounds per game is evidence of this. Bargnani’s ability to play both positions as well as stretch the floor and create space down low will allow Carmelo to spend more time at his preferred small forward position as well as get big defensive bodies out of the paint. In my opinion, this can and will help the Knicks improve their rebounding issues. Couple all of the previously mentioned positives with the fact that Bargnani adds some much needed depth, has an expiring contract at the same time as Amare Stoudemire, Tyson Chandler and potentially Carmelo Anthony (of he takes up his player option) and it is easy to see why the Knicks wanted Bargnani. The only true question mark in this trade is the inclusion of a 2016 first round draft pick by the Knicks, as we have seen time and time again the Knicks throw away young talent. Only time will tell as to whether this trade has been won by the Knicks or won by the Raptors, however one must admire the Knicks courage to make moves in order to give themselves a chance at making the most of their championship window.